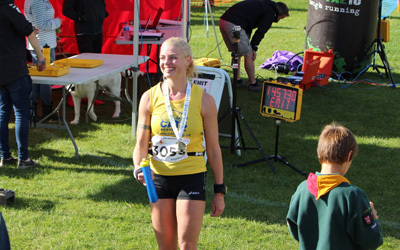 Emma Challis - All You need to do is run! Some runners make it look so effortless: “I bet they’ve been running since they were at school,” you think, as you watch them cover the ground in long, easy strides, “They probably have a perfect training plan and improve steadily year on year. I could never be like them!” But as we all know, every runner has their story, complete with setbacks and moments of doubt. Emma Challis tells us hers below. Hopefully she will inspire you to take on your next challenge – you never know, you might just surprise yourself! For most of my life I had never thought to run past 2 miles. However, in 2012 I ran with a friend and surprised myself by running 4 miles with no effort. 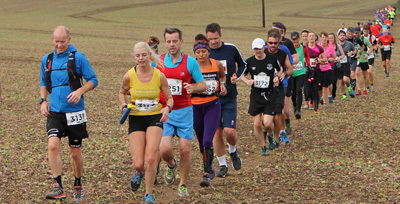 I was then persuaded to enter a 5 mile race even though my self-consciousness held me back. In the end I was very glad I did this as I absolutely loved it. In 2013 I ran 10 half marathons and 1 full marathon, and I was hooked. In 2014 I ran 9 full marathons including my first 50k. 2015 was my first Clarendon and in the same year I completed 13 further marathons including a 37 miler. I also took part in my first middle distance triathlon and dreamed of completing a full distance triathlon! In 2016 I suffered a setback when I developed devastating blood clots, in all my limbs, pelvis and lungs. My heart was affected, my kidneys damaged and my lungs got scarred. My condition was so serious the doctors were amazed I was still alive let alone running. Further investigation revealed that I have a genetic condition called 'Factor V Leidens'. To reduce blood clotting in my veins, I am now on medication and will be so for the rest of my life. Bum! However, I soon noticed that I was actually running faster. I realized I had had symptoms for years before diagnosis. In fact, 16 years! So, my body was strong and was now benefitting greatly from the new medication. I still completed 17 marathons in 2016 including another Clarendon and some ultras of up to 45 miles. But I thought I would never be well enough to complete a full distance triathlon. In 2017 I completed 20 marathons/ultras and 2 middle distance triathlons. Each almost an hour faster! I began to hope again. In 2018 I completed a full distance triathlon, The Outlaw, in 14 hours 27 minutes. A most amazing experience. I felt stunned at the end. Even though I broke my left foot 3 weeks later I still managed to complete 19 marathons/ultras in 2018. I hope to inspire people. I was 40 when I ran my first marathon. Never too late. Never give up. Keep enjoying. I love surprising myself. Over the finish line. 26 miles done and dusted! - Book Your Place -SIgn up Today! We are very grateful for the continued support from the following people and organisations. Please support them by clicking on their logos to visit their websites. 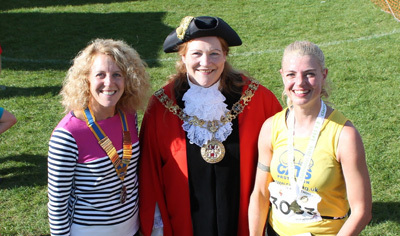 The Clarendon Marathon is a charity event managed by Rotary. Chairman: JJ Heath-Caldwell. Administration: Fiona Whitehouse. Race Director and Marketing: JJ Heath-Caldwell. Deputy Race Director: Nick Bell. Athletic Club Liaison: Rob Carter. Website: Simon Applebaum. Social Media: Matthew Morton & Vicky Pugsley. Health & Safety: Steve Marriott. St John's Ambulance Liaison: Caroline Rubin. Road Closures: Jackie Porter & Dominic Hiscock. Parish Council Liaison: Jackie Porter & Tricia Meads. Salisbury Liaison: Bob Dunster. Broughton Liason: Mark Robinson. Finance: Hugh McNeil and James Murdock. Marthon Programme: Duncan Rutter & David Farthing. Charity Welcome Stations: Margaret Woodhead. Finish Manager: Giles Peck. Timing: Richard Spalding & Chris Towle. Photography: James Larcombe & Joe Bright. Radio & PA Announcements: Anna O'Brien. Sponsors & Gifts: Anthony Arkwright. Press Liaison: Rachel Masker. Bike Team Leader: Rob Carter.